PRODUCT: MasterSeal TC 225 (aka TC 225HT, formerly called Sonoguard) Top Coat Waterproofing CHARCOAL GRAY COLOR. The Topcoat is Part of a complete traffic grade waterproofing membrane system. 5-Gallon Pail. Price/Pail. * UPS Ground or truck Shipment Only. APPLICATIONS: Used together with MasterSeal M 200 or 265 Basecoats, the MasterSeal TC 225 Tan Top Coat for pedestrian-traffic areas. Use the MasterSeal TC 225HT traffic grade waterproofing membrane system on concrete balconies, plaza decks, stadiums, and mechanical-room floors. Also apply it over exterior-grade plywood to waterproof and decorate balconies and decks. 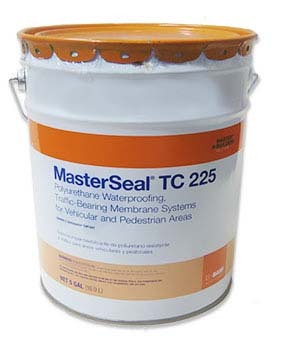 MasterSeal TC 225HT is an alaphatic moisture curing polyureathane membrane.